It's hot out there. Cool down with one of these watermelon offerings from local restaurants. Libby's Cafe + Bar's watermelon bourbon smash. At the CinéBistro bar and lounge, the watermelon mojito blends Bacardi Grand Melon, Watermelon Pucker, muddled mint leaves and simple syrup for a summer refresher that’s poured over ice and served in a tall, slim pilsner glass. Garnished with a watermelon wedge, it is as pretty as it is delicious. $10.50. 3501 S. Tamiami Trail, Westfield Southgate, (941) 361-2456. At The Table Creekside, chef Pedro Flores’ Savor Sarasota menu features watermelon Greek salad for a first course. Chunks of watermelon are mingled with mushroom confit, crispy black olives and Greek goat cheese and then sprinkled with a mint-mojito vinaigrette and garnished with a clump of micro greens. The kicker is those roasted-toasted black olives. $29 for three courses; the Savor Sarasota menu is still going at The Table. 5365 S. Tamiami Trail, Sarasota, (941) 921-9465. Selva in downtown Sarasota is famous for its seafood ceviche Peruvian style. The watermelon ceviche is called tuna tradito nikkei and combines fresh sushi-grade tuna marinated with ginger, soy sauce and cubes of watermelon. The taste is sophisticated, bright, clean and utterly delicious. $14. 1345 Main St., Sarasota, (941) 362-4427. At Apollonia Grill, the Geek watermelon salad starts with pieces of watermelon mixed with field greens and slivers of red onion and then topped with crumbles of feta cheese and a tart and tangy balsamic vinaigrette. The balance between sweet and sour is ideal. 8235 Cooper Creek Blvd., University Town Center, Sarasota, (941) 359-4816. 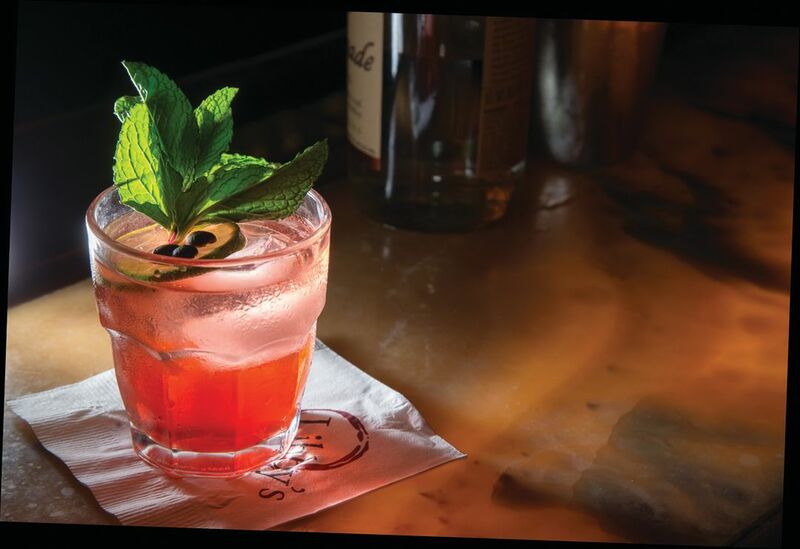 Beverage director Adam Stoneking at Libby’s Cafe & Bar has created the watermelon bourbon smash (pictured above), a guaranteed refresher and relaxer. This original cocktail combines watermelon purée, bourbon, lime, mint leaves and simple syrup. The fragrant liquid is double strained and poured into a rocks glass with one large ice cube. $8. 1917 S. Osprey Ave., Sarasota, (941) 487-7300.